Although the sound in these resurrected live recordings is well short of what is acceptable in historic remastering nowadays, the brilliance and sheer élan of Sir Thomas Beecham's interpretations shines through each work with renewed vigour and intensity. 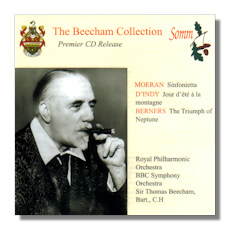 My great favourite is the D'Indy work where Beecham is at his pictorial best and it is a great pity that we cannot hear this wonderful recording of what must have been a scintillating live performance. The Moeran's Sinfonietta is also given an excellent interpretation, here is a work which is really suited to the Beecham "touch" as has often been described. The Lord Berners suite has also been recorded in far better sound but it is also good to have this excellent live performance as a studious comparison. As I already indicated, the sound mars these fine performances by a generally restricted dynamic range and some distortion as well as the occasional dropout. However this is compensated by the excellent notes by Beecham authority Graham Melville Mason and some rare photographs from Lady Beecham's private collection. Fans of this great conductor should obviously not hesitate.